Royal Cornhill Hospital, Aberdeen was opened in 1800 as Aberdeen Lunatic Asylum. The connection with this to Glenbuchat may seem strange but there are a couple of connections. The article below refers to Dr. William Reid is descendant from a famous Glenbuchat family. The Reid family of Baltimore and was superintendent of the Asylum. The other connection is that in the grounds was a monument to John Forbes, Bombay Jock, who provided a donation of £10,000 to the hospital. This was probably related to his friendship with Susan Carnegie. 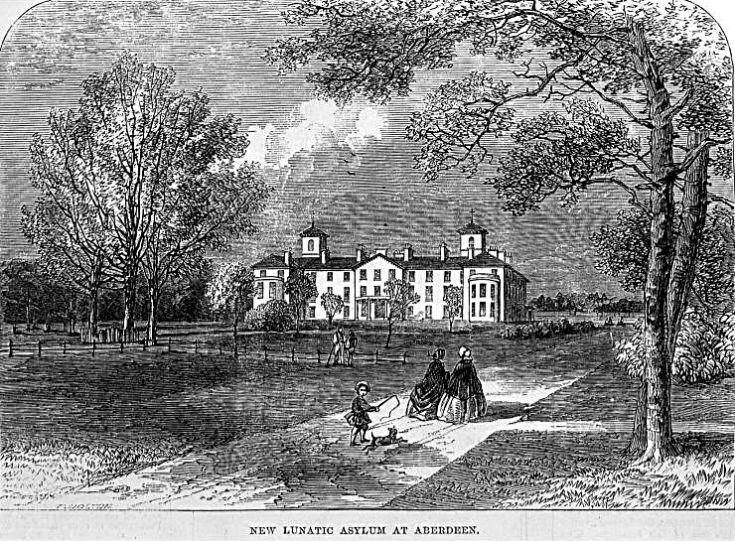 Mrs. Susan Carnegie of Charlton founded the Montrose Lunatic Asylum in 1781 for the treatment of private and pauper patients, the first mental hospital in Scotland. Thus developed his support of mental welfare. Dr. William Reid is descendant from a famous Glenbuchat family. The Reid family of Baltimore. William Reid MD was born the 4th son of the Rev'd William Reid and Elizabeth Scott in 1854. William was a doctor of psychiatry and the Physician Superintendent of the Royal Asylum in Aberdeen. He entered as an assistant physician in 1876 and was promoted on the death of the previous Superintendent in 1885. He lectured on psychiatry to many generations of Aberdeen University men and according to an obituary in the Journal of Mental Science in 1918, Dr Reid was a big man in every way 'His handsome presence and indefinable personality will be missed in Aberdeen for many years to come. He was absolutely adored by his patients; as though he did not carry his feelings on the surface, his winning personality and overflowing kindness of heart made him an ideal mental physician'. He was also apparently passionately devoted to golf, was well known on the links of Balgownie, Cruden Bay and Lossiemouth and his library contained every known book on the game. Dr Reid died on 3rd September 1918 and was survived by his wife and two daughters. John Forbes' donation was for the Clerkseat site just under half a mile to the south of the Elmhill estate which was bought 60 years after the Clerkseat estate. It was severely damaged by a bomb in April 1943 when it was used as staff accommodation.